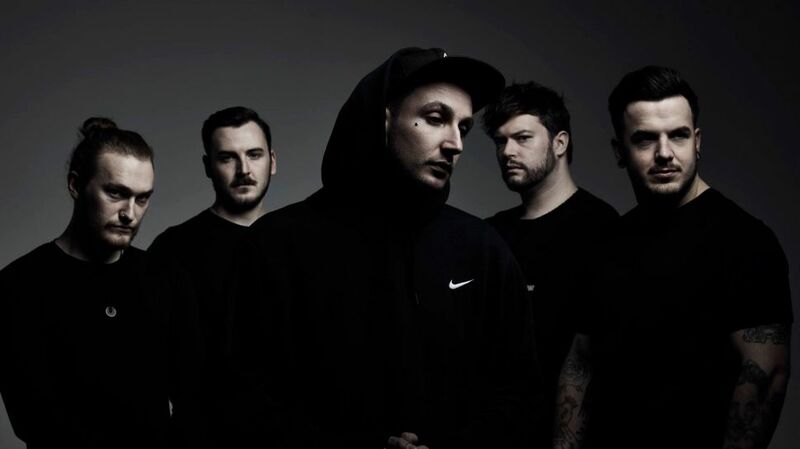 In January 2018, SHYV were thrilled to be asked by the upcoming metal core Southampton band “Our hollow, our home” to sing on one of their songs for their next album. The band are very popular in Europe where they have had successful tours. 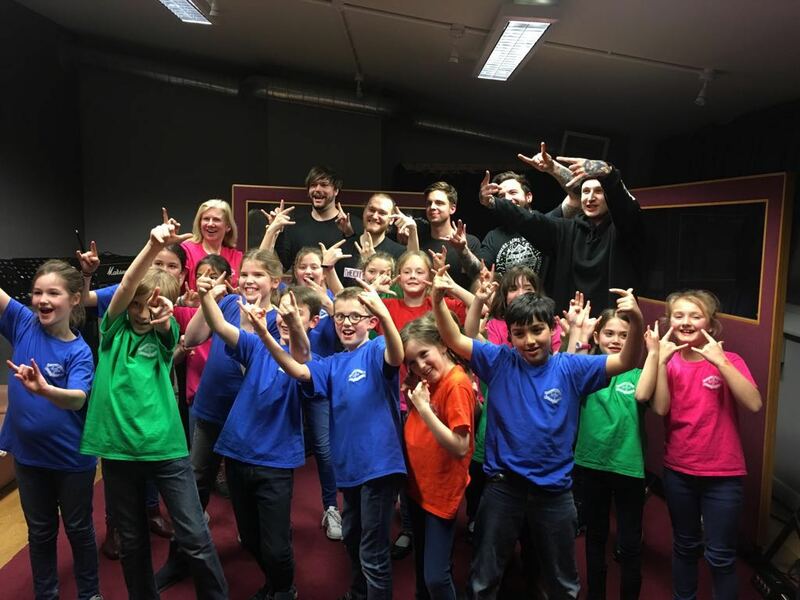 A date was set in February at the WaterRat Music Studios in Woking and the choir busily set to work learning the lines and the harmony, whilst the Dad’s who were keen on heavy rock were very keen to chauffeur and chaperone for the trip!! Extra rehearsals were held in lunchtimes to work on extending the range of the voices as it sat very high for the children. The song, written by Tobias Dominic, is called “Speak of Sorrow” and was written as a reaction to the passing of his father a few months earlier. Tobias explained to the choir how grief-stricken he felt at this loss and how he had not felt that helpless since he was a child. 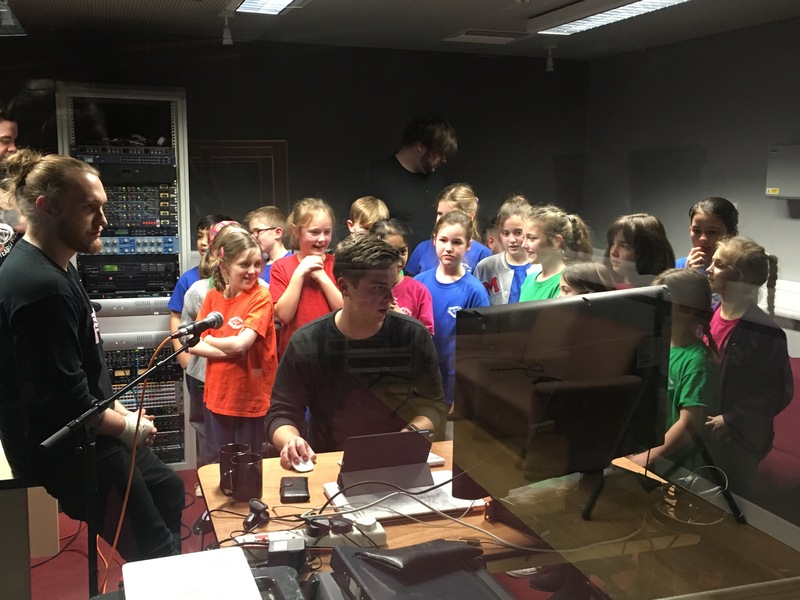 He therefore wanted children’s voices singing on the track to portray those feelings of returning to the emotions of childhood. The lines the choir were asked to sing – “the chapters change but the stories stay the same; you went with the sunshine left me with the rain” – refer to the loss and helplessness he felt. We started with just Debbie having headphones, but it was agreed that to get the timing exact the choir needed to wear them as well. This took a little while to set up and caused great excitement. 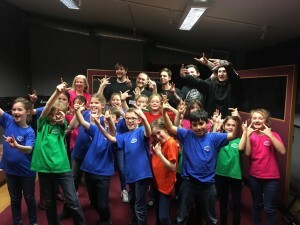 So much excitement that when we started singing the sound engineer spoke to Debbie through the headphones to ask if the soundproof door was open and sure enough it was wide open with a row of parents armed with cameras taking photos completely forgetting the idea of a what a soundproof room should be!!!! The lines were first recorded in the lower octave and then the harmony singers recorded their harmony part. 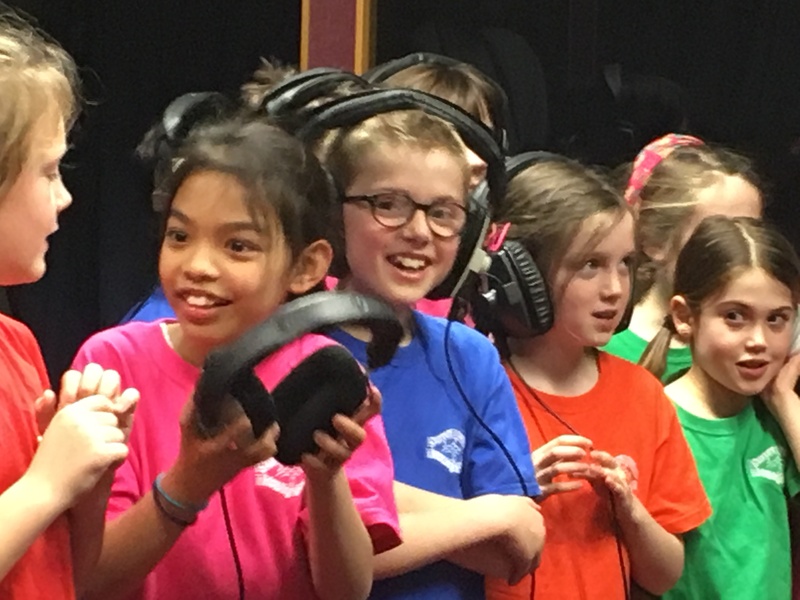 By the time we came to record the melody at the higher octave the children’s voices were truly set in the low part of their voices and we struggled in the remaining time to find the beautiful high voices that we had worked so hard on finding at the rehearsals. However, the band were very kind and supportive and eventually the sound engineer declared that we had enough for him to put together. I will leave the remainder of the story to three members of the choir who wrote an account of the trip below. We had a competition which was judged anonymously by the Head at St Cuthbert Mayne School and these are the two winners and runner up. We’d like to thank the band for inviting us to sing for them and for making it such a wonderful experience for the choir. It will be a memory for life. On 22nd February me and my choir went to a recording studio in Woking to be recorded with a local band called “Our Hollow, Our Home”. They are a heavy metal core band and you can hear them on Spotify! “The chapters change, but the story stays the same. You went with the sunshine, left me with the rain”. After a few attempts we had a 5-minute break. Once our break was over we got started on the “high pithed” hard bit, but we all wore headphones to make it easier for us Once we completed this, some of the choir went on to record the harmonies. After all that, the band had left us lot of chocolate cakes and biscuits to eat!! After a while we went to see the band, and got to hear our recorded singing with the band’s recorded singing. We then had a photo with the band. There were only 4 in the band, as the drummer was away. They were really nice guys, and we got their autographs and we all received a wrist band. The band hope to release the single in June or July, and it will be on their album in October. They will be touring in the UK and many countries throughout Europe over the summer. After all that we went home, having had an amazing time and full up with cake!! 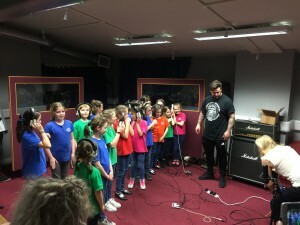 I was lucky enough to go with the Surrey Hills Choir to a recording studio in Woking to sing a song by the heavy metal rock band “Our Hollow, Our Home”. When we arrived, everyone was there and we got to meet the band. When we got into the studio, Debbie was given some headphones. But because we couldn’t hear the music all of the choir got given some too, although the headphones got into a tangle, but the band still sounded amazing, singing their song. I felt really lucky to be in a recording studio with a real band. 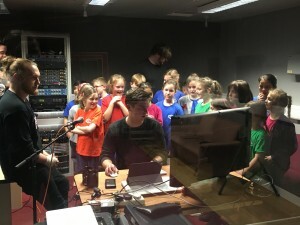 Once the song was recorded we had a listen and it sounded fantastic! We couldn’t believe it was us singing. Then we were treated to cake, brownies, Mr Kipling cakes, rice crispy cakes, don’t get me started on what else!! It was an awesome opportunity to do this, it was a dream come true. to a recording studio in Woking. And couldn’t wait to tell everyone at school. Was an enormous pile of cakes!